At the new Abington Bridge ribbon-cutting ceremony today, Bundarra Central School representatives Irene Hickman, left, Paige Vickery and Tahleah Gleeson, Senator John Williams, Minister for Roads and Freight Duncan Gay, Northern Tablelands MP Adam Marshall, Mayor Mick Pearce, Cheyenne Hosking, Bianca Nelson, Bundarra Central School Principal David Bieler, Luke Berry and Cowen Campbell. THE last freight pinch-point in the Northern Tablelands section of Thunderbolts Way disappeared today with the opening of the new dual-lane Abington Bridge by NSW Roads and Freight Minister Duncan Gay and Senator John Williams. The original one-lane wooden bridge has carried traffic over Abington Creek for 92 years, local State MP Adam Marshall said, but a lot has changed in the century since the timber bridge was state-of-the-art. “Road transport has grown bigger and faster, and that meant that the old bridge had to be load- and speed-limited to modern traffic,” Mr Marshall said at today’s opening of the new bridge. The old bridge was speed-limited to 45 km/h, and was unable to support heavy and over-width vehicles, forcing heavy transport to detour about 30 kilometres. “This new bridge effectively condenses 30 km of wasted travel for heavy vehicles into a few hundred metres,” Mr Marshall said. The NSW Government contributed $705,000 towards the new Abington Bridge, under its Fixing Country Roads program. It follows the State’s $3.5 million funding of the $4.2m Emu Crossing Bridge, opened last year, which replaced the 96-year-old Emu Crossing with a dual-lane concrete bridge. 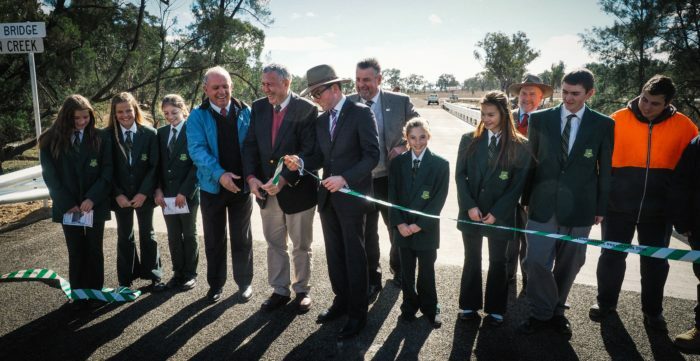 Uralla Shire Mayor Mick Pearce warmly welcomed the opening of the new bridge. “Thunderbolts Way is a vital tourist and transport route, and the old bridge infrastructure was always something of a burden to Council and a pinch-point for those who travel the route,” Cr Pearce said. Local grazier and University of New England Chancellor James Harris, owner of the bridge’s namesake property ‘Abington’, is relieved to see the old bridge go because of the potential for accidents on it. “At times it’s been plain dangerous,” Mr Harris. The new concrete structure will also eliminate the ongoing maintenance the old bridge demanded. However, Mr Harris observed that one group doesn’t welcome the retirement of the old bridge, and its almost annual inundation by flood. “The kids on Abington are furious, because it means they can now get to school every day of the year,” he said.